Walking towards the MRT station from BUNC! Small hearts with Korean Queen, Ana! I bought an EZ-Link card from the train's customer service booth so I won't have to buy train tickets everytime. This card could also used in all public buses, SMRT and Transcab taxis and other selected shops/stores. It costs $12, out of which $7 is stored value for use. Cards sold at 7-Eleven cost $10, out of which $5 is stored value for use. The remaining $5 is the cost of the card and it is non-refundable. Each ez-link card has a lifespan of 5 years from the date of encoding! Nice. 1st Stop: RASAPURA MASTERS food court for lunch! It's a hawker style food court in Marina Bay! Buy from stalls selling delicious international cuisines! Bought this Masi Lemak meal for $9! Quite pricey compared to other food places but the serving is huge! Wasn't able to finish it. 2nd Stop: Marina Bay Sands Tower 2 for our tour! Here we met up with Sarah, Communications Executive of Marina Bay Sands. She toured us inside the hotel and showed us what makes Marina Bay Sands the best hotel in Singapore! Our first stop is this room with an amazing view of Singapore! Can you see the Merlion, Fullerton, Esplanade and other significant structures in SG? Thank you Sarah for our pic! She then escorted us to the grandest suite in the hotel--- Straits Suite! "Ascend to an opulent paradise on the 50th floor or higher, where some of the best views in the city are reserved for a privileged few. With two bedrooms and a baby grand piano in the elegantly furnished living room, your spacious 330sqm Straits Suite recreates the ambience and intimacy of a refined personal residence. Pamper yourself with an in-suite massage and soak in the Jacuzzi after a rejuvenating workout in your private gym. Your leisure and entertaining needs are covered by a media room with karaoke, and dedicated butler service to cater to your every wish." This is the Master's Bedroom! OMGGG. There's a flatscreen TVs in all bedrooms, living room and media room. A walk-in closet! Microfibre and terry bathrobes, Hairdryer, Bedroom Slippers, Iron and ironing board, Shoe brush & shoe horn etc. Bed fit for a King! Coz it's a King bed. Hehe. It has Frette luxury bed linens and pillow menu. 2 Queen Beds in the 2nd bedroom! There's a work desk inside and this view! Bathroom of 2nd bedroom. Love the tub! Private door for your dedicated butler! So fancy! I've been wanting to see this since forever but it's super exclusive and is only accessible to hotel guests. So happy I finally got to see it! We were only allowed up to a certain area though but that's okay. See more photos below! Relax in utmost luxury at the world's largest rooftop Infinity Pool, sipping champagne and looking out over the breathtaking city skyline. Imagine yourself floating in the world’s largest rooftop Infinity Pool, gazing down on the glittering city-skyline from 57 levels above as the lines between fantasy and reality blur. Go ahead. Indulge. Sip on champagne and drink in the mesmerizing beauty of a sunset amidst the clouds, or stretch out to sunbathe on a luxurious poolside lounger. You won’t find a more spectacular photo-taking spot anywhere in Singapore. Opposite the pool is this jacuzzi area with a wonderful view! Armin had an event a few days after! OMG. 5th Stop: Marina Bay Sands Skypark Observation Deck! You haven’t seen Singapore until you’ve seen it from Sands SkyPark Observation Deck, soaring 57 levels above the heart of the city. Drink in the panoramic vistas of the stunning Marina Bay, the world-class cityscape, the architectural wonders of Supertree Grove, and the vibrant colors of Gardens by the Bay. From Marina South Pier all the way out to the Singapore Strait, get a bird’s eye view of the bustling shipping lanes that have built Singapore’s rich multicultural history. I can see the National Stadium! ArtScience Museum is devoted to the exploration of art and science and the connections between them. In this permanent exhibition, the creative threads by which art, science, technology and culture are inextricably bound are expressed in immersive, interactive artworks by teamLab -- a group of ultra-technologists (artists, engineers, animators, mathematicians & architects) known for their innovative use of digital technology as a medium for art. Together, ArtScience Museum & teamLab created Future World. Consisting of 15 major installations and interactive projects for adults & children, it is an invitation to have fun, to play and to explore, but also to reflect on our own position relative to the natural world, other people and the universe. It is organized into 4 themes: Nature, Town, Park & Space. Your adventure begins with an immersive and mesmerizing journey through Nature. Featuring artworks that use both art and science to bring you inside the heart of nature comprised of digital technology, simultaneously connecting you to and challenging your perceptions of the natural world. The first gallery is an immersive installation depicting birds from Japanese mythology. Crows are Chased and the Chasing Crows are destined to be Chased as well, Transcending Space. This immersive audiovisual installation depicts the creation of life and takes visitors inside the heart of nature. The artwork features crows, rendered in light, that fly around the space leaving trails of light in their path. Swooping through the space and chasing one another, the crows collide, creating colourful flowers in their wake. They represent the Yatagarasu, a three-legged crow which is believed to be the embodiment of the Sun in Japanese mythology. The formation of the flowers resulting from the crow's collisions alludes to the genesis of life from the Sun's energy. Super trippy! We went inside a room and were told to stand inside a circle near the door. Then the whole room comes to life through an amazing film showing. Felt so dizzy afterwards. Haha. The 2nd gallery is a poetic seascape that combines the elegance of traditional Japanese art with contemporary scientific data. Black Waves is an expression of nature, rendered entirely in digital technology. It depicts the sea in the style of traditional Japanese painting. In the Japanese tradition, oceans, rivers and bodies of water are often represented as a series of curvilinear lines. The movement of these lines gives the impression that water itself is alive. teamLab have created this effect by calculating the interaction of hundreds of thousands of individual water particles, and then representing the movement of waves in a crescendo of white foam in a virtual 3D environment. Black Waves blurs the boundary between viewer and the artwork, and invites visitors to regard themselves as part of the seascape, thereby understanding that there is no separation between ourselves and nature. It's a whole room of moving waves. It's actually very calming. I love it. The final artwork positions the viewer as a life-giving light playfully inviting the visitors to glide down in an interactive slide to depart NATURE and enter into TOWN. Transiting from the Nature section of the exhibition, to the Town section, is a new artwork, that will take the place of the physical slide in Future World. Sliding through the Fruit Field is a playful and colourful interactive artwork designed for children that is projected onto a newly designed slide. Visitors become a beam of life-giving sunlight, and as they glide down the slope, their energy is transferred to the fruit field, causing flowers and fruit to blossom and grow. As the different elements interact in the field, new seeds are sown, leading to new life. Your journey continues with a playful glide down a slide into Town, a bustling and lively cityscape where visitor-generated input builds and populates virtual towns. 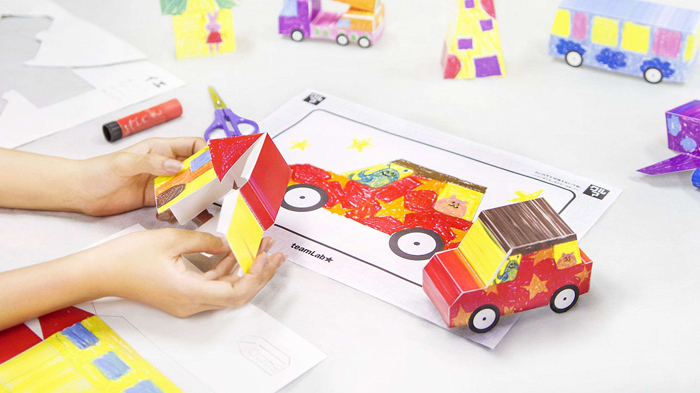 Try your hand at urban planning and design in fun and innovative ways. If you've ever been caught in slow traffic, you'll appreciate this unique chance to design your own transportation network with Connecting Train Block. This interactive artwork reacts to your input and ultimately develops into a vibrant, thriving cityscape. The installation begins by projecting moving cars, trains, planes and boats onto a large surface. You'll use physical wooden blocks to design and connect an evolving system of roads, rivers and railways to keep the ever-increasing traffic flowing smoothly. Just like in real life, the challenge of keeping everything moving grows with the amount of traffic! A Table Where Little People Live : The little people are a community of miniature characters projected onto a table. When left alone, the little people move around their environment, walking, jumping, sliding, hopping and generally paying little attention to the world outside. But when they have visitors, they love to play! Place your hand or an object on A Table Where Little People Live and the little people will notice and jump onto it. The actions of the tiny characters change in response to the shape and colour of the objects, becoming more animated as you introduce more and more objects into their world. Create playful and vibrant structures from stacking blocks that glow and change colour when you connect them together. Let your imagination be your guide as you construct functional furniture like chairs and benches, architectural structures such as walls and partitions – or simply bring the images in your mind's eye to life! The high-tech blocks communicate information to each other when they are connected, changing colour with every addition or subtraction from your artwork. With endless variations of colour, light and form to explore, Media Block Chair provides hours of fascinating fun for visitors of all ages. Sketch Town is a depiction of a fictitious town, based on Singapore that includes recognizable landmarks, such as, ArtScience Museum, the Merlion and the Singapore Flyer. Young visitors use crayons and paper to draw a building, a car, or a plane for Sketch Town. When their two-dimensional pictures are placed in a digital scanner, they enter the town, becoming 3D animated objects. The visitors' urban designs become part of a vast projected city, which they can physically interact with through touch and movement, bringing the town to life. Touch a car, for example, and it will speed up, or change direction. The fun continues at Sketch Town Paper Craft where you are able to turn your 3D digital drawings into physical paper craft models. Print your 3D drawings as an original paper craft pattern that you can assemble into a unique 3D model and perfect take-home souvenir today! Move away from the busy urban pace of Town to visit an uplifting recreational Park, where you are invited to appreciate 'play' as an essential part of human life. Visitors of all ages can learn and play using a combination of physical activity and digital technology. Discover the exhibition's spectacular centerpiece, Universe of Water Particles – an seven-metre tall virtual waterfall. Hundreds of thousands of water particles cascade down the façade of a virtually sculpted rock, with each particle of 'water' digitally programmed and generated to flow according to the laws of physics. An uncannily accurate simulation of a true waterfall that appears to be alive, this installation will astound you with its realism. Be immersed in a moment of magic as you behold the grandeur of nature and consider the awesome might that flows through and sustains it. Enjoy creating a playful and dynamic space with other visitors, as their participation with the Light Ball Orchestra sends out ripples in different directions to interact with yours. Work together by pushing, bouncing and rolling the balls to continuously change the composition, color and sound of the orchestra. Beachball-sized globes of multicoloured light and sound are your instruments in this electrifying, one-of-a-kind orchestra. Touch any ball to change the colour and sound of the balls around it, creating a resonating effect throughout this dazzling environment. Create! Hopscotch for Geniuses is a fun game of discovery that tests the skills and imagination for all ages. Special connections exist between the shapes – you'll have to practice playing the game to learn what they are! Design your own customised hopscotch game in this unique installation. Arrange circles, triangles and squares on an electronic tablet, which are then projected onto the floor. When you expertly land on the same shapes in succession, you'll trigger off beautiful colours and sounds that reverbrate throughout the space. Just as in nature where no two moments are repeated, your every encounter with The Story of the Time When Gods Were Everywhere promises to deliver a unique experience that can never be replicated. Inside this digitally projected world, create your own environment by touching hieroglyphic characters and watch them transform into natural elements such as wind, rain, trees and mountains. The enthralling story of creation begins when you touch the characters, and the movement of your body further changes and evolves the world around you. Enter the heart of celestial Space for the breathtaking finale of your journey. Be spellbound by the beauty and magnitude of the cosmos and thrill in watching your actions forge the shape of a monumental digital universe. End your journey on a note of wonder by embarking outward and upward into astronomical Space. Immerse yourself in what has been the subject of dreams, mythologies, artistic visions and scientific exploration since the dawn of human history. Behold a seemingly infinite number of light particles inside the scintillating Crystal Universe. This stunning artwork is created with teamLab’s Interactive 4-D Vision technology and more than 170,000 LED lights, giving the illusion of stars moving in space. Move beyond the stars to encounter astrophysical phenomena such as planets, galaxies and even gravitational waves. Find yourself at the centre of the universe, as the light and body of the installation responds to your mass and motion. Change the fabric of the universe itself by 'swiping' planets and stars from smart devices within the installation, and watch them become part of the dazzling environment around you. Surrounded by celestial wonders, reflect upon your own place within the vastness of the cosmos. It was almost dinner after our museum tour, so we decided to eat dinner na and then watch the light & water show at Gardens by the Bay and then Marina Bay. We went back to the Rasapura food court where I finally had my Indian cuisine fix and then the girls finally had Ilao Ilao for dessert! Haha. You could access Gardens by the Bay from Marina Bay! Just in time for the GARDEN RHAPSODY show! Themes from our favorite movies played! So cool. We were dazzled by the magnificent sight of our Supertrees. The show is at 7:45 and 8:45 daily! The show could have been spectacular were it nor for the noisy tourists beside us. Argh. Our walk back to Marina Bay for our 2nd light show that night! Beautiful view while Waiting for the show! This is Marina Bay Sands' Wonder Full show! An amazing convergence of light, music and sound, Wonder Full illuminated the universal tale of the journey of life in a spectacular 13-minute showpiece of visual effects by the waterfront, with the stunning cityscape of Singapore lit up in the backdrop. The show featured motion pictures, music produced in Singapore with heavy local influences, an original sound score and an abundance of technologies spanning the 15.4 hectare (38 acre) Marina Bay Sands site. After the show, we bought snacks from 7-11 and then boarded a train back home to BUNC in Little India. :) Such a tiring but fruitful day!